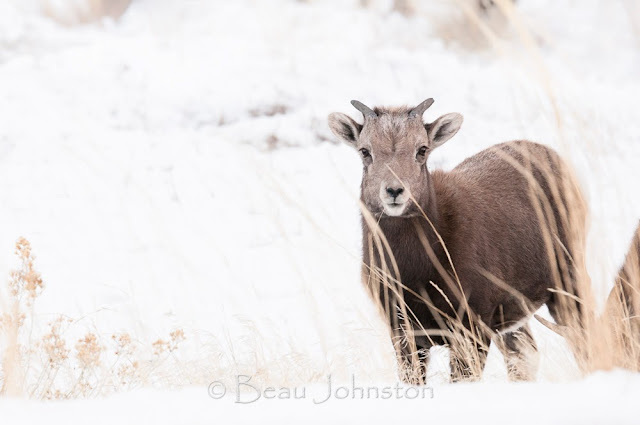 I recently had the opportunity to visit Cody, Wyoming to photograph the bighorn sheep rut. The rut, which runs into mid-December here in Wyoming, is a great time to photograph the wild sheep. Four of us braved the winter chill and headed west, from Cody, along the North Fork Highway (Hwy 14/16/20) toward Yellowstone and into the North Fork of the Shoshone Canyon. They say 'luck is the result of hard work and preparation.' I think luck is the result of getting up early and braving bitter cold winds! While I am no expert in wildlife photography, I have noticed that big game animals are most active right after sun-up and right before sun-down. Not only is this when the wildlife is most active but it offers the best lighting. 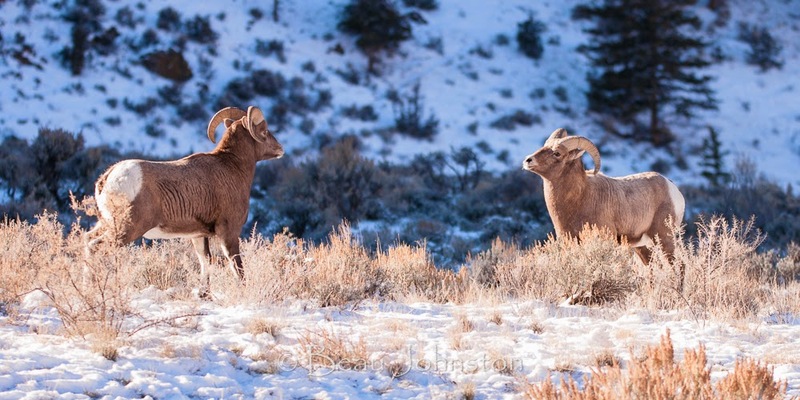 The bighorn sheep overnight in the protection of the cliffs above the Shoshone River and venture down to the flats along the river during the day. The ewes and lambs were typically the first to begin the journey down to the low-lying flats as the sun began to rise. The younger rams would be in tow, with the mature rams generally joining the group later in the morning. We had all hoped to see the large full-curl rams battling for breeding rights over the ewes but we had arrived toward the beginning of the rut (Nov. 24) and only the younger rams were sparring. Even this was limited and most confrontations, as the above image portrays, ended in a draw. The three mature rams, in the herd we photographed, were quite content hanging out together and grazing, preparing for the battle that lay ahead. Occasionally a ewe would wander past one of the rams and they would become interested and follow behind, but most occurrences were short lived. They kept a watchful eye over the herd as the younger rams wasted energy chasing the ewes around. 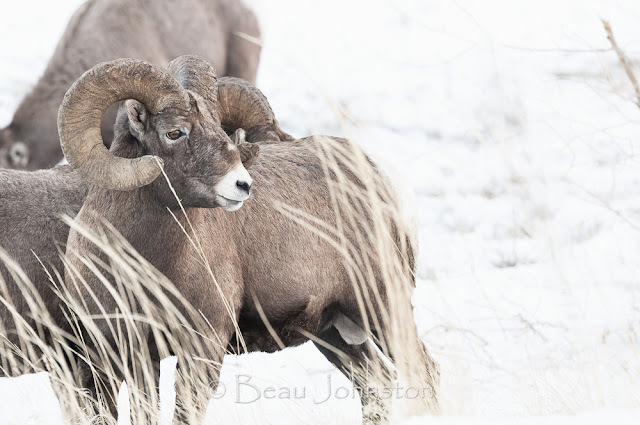 While we had timed our trip too early to see the rut's peak action, I thoroughly enjoyed my encounter with the bighorns. 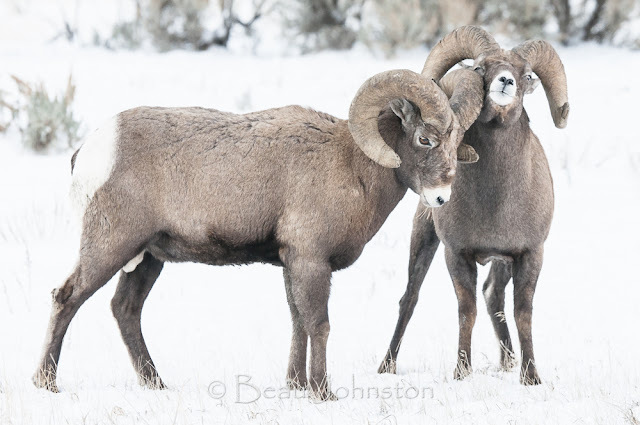 The lack of fighting allowed us a glimpse into the bighorn's lives that few people focus on. It was incredible seeing this year's lambs effortlessly jumping down from ledges, well over 6ft tall, and gracefully land as they followed their mothers. I am pretty sure I would break my neck if I attempted to follow these little guys around. By this time of year the lambs had been fully weaned and were foraging for themselves. My journey home took me past Boysen Reservoir. I stopped to watch the waterfowl and try and photograph a pair of swans I saw from the highway. The birds proved to be elusive, flushing at the first sign of movement on the shore. As I get back into the truck I noticed the sun setting over a nearby Russian Olive tree. 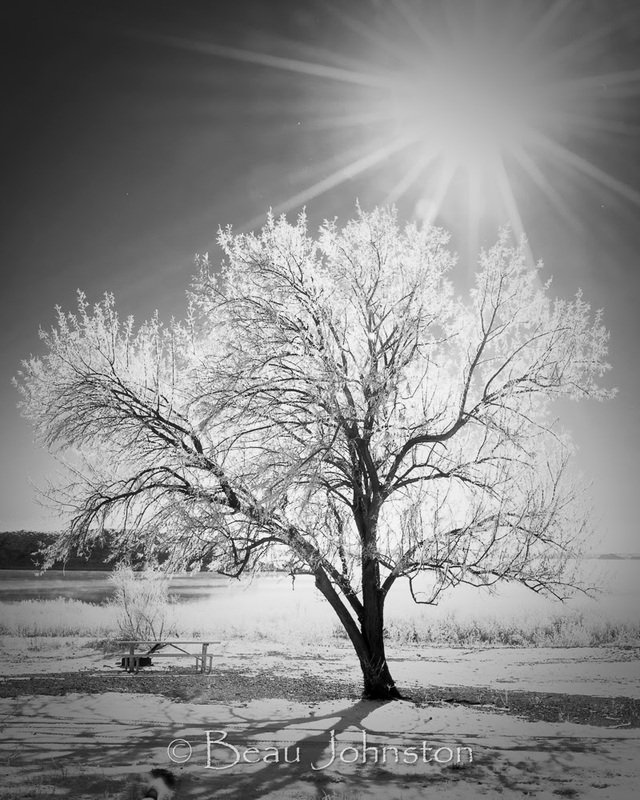 The tree, whose leaves were covered in frost, was aglow in the fading sunlight. It was a fitting ending to the weekend's adventure - Life may not turn out the way you plan but if you stop, take a breath, and look around you will probably find something beautiful worth enjoying. Another reason we are thankful to now being residents in Wyoming - yep we have been here for just over a year. While our life has not turned out the way we expected and moving to Wyoming was never in our long-term plan, I am thankful for every moment of this adventure and that I get to experience it with such a great wife - Krista! © 2019 Living Overland. All Rights Reserved.